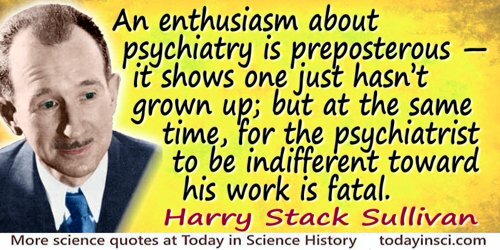 An enthusiasm about psychiatry is preposterous—it shows one just hasn’t grown up; but at the same time, for the psychiatrist to be indifferent toward his work is fatal. The Psychiatric Interview (1954, 1970), 10. Quoted (without source) in Nick Rider, Yucatan & Mayan Mexico (2005), 200. Nature. As the word is now commonly used it excludes nature's most interesting productions—the works of man. Nature is usually taken to mean mountains, rivers, clouds and undomesticated animals and plants. I am not indifferent to this half of nature, but it interests me much less than the other half. Samuel Butler, Henry Festing Jones (ed. ), The Note-Books of Samuel Butler (1917), 220. Nothing is indifferent, nothing is powerless in the universe; an atom might destroy everything, an atom might save everything! In Aurélia ou Le Rêve et la vie (1855). Over the past fifty years or so, scientists have allowed the conventions of expression available to them to become entirely too confining. too confining. The insistence on bland impersonality and the widespread indifference to anything like the display of a unique human author in scientific exposition, have transformed the reading of most scientific papers into an act of tedious drudgery. In Boojums All the Way Through: Communicating Science in a Prosaic Age (1990), Preface, xi-xii. Diary entry for 21 Feb 1940, The Burning Brand: Diaries 1935-1950 (1961), 169. 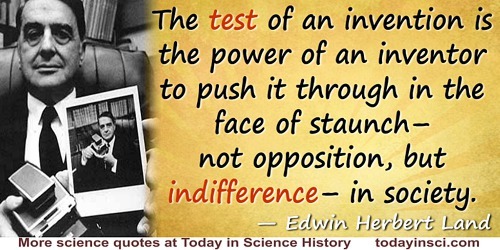 The test of an invention is the power of an inventor to push it through in the face of staunch—not opposition, but indifference—in society. Speaking at a shareholders' meeting (1975) as quoted by Victor K. McElheny, in Insisting On The Impossible: The Life Of Edwin Land (1999), 404.